It’s awesome when a shoulder surgery patient promotes the doctor in a cool and funny way. 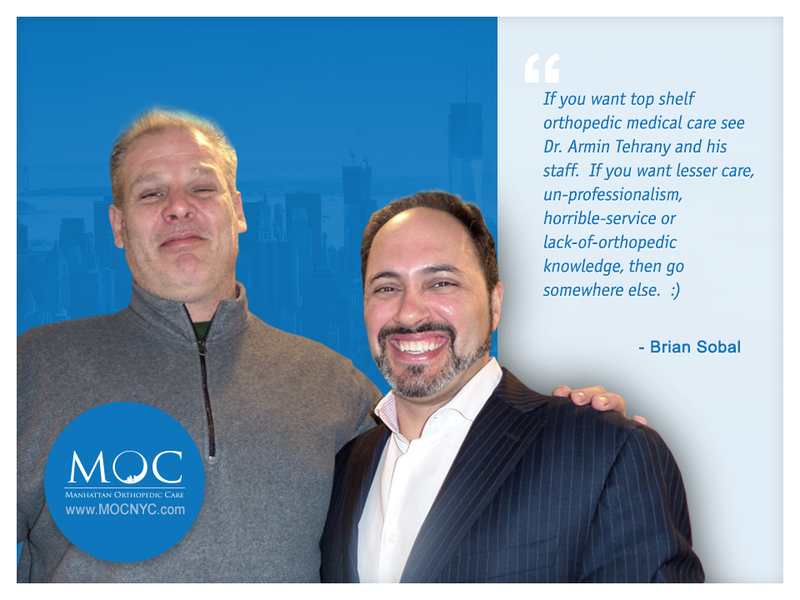 When Brain Sobal came to Manhattan Orthopedic Care, we didn’t see a positive and humorous person; we saw a worried man trying to find a way to keep his work ability and the support for his family. Dr. Armin Tehrany knew exactly what needed to be done. Before the shoulder surgery, he had a quiet and thorough consultation with Mr. Sobal, where he convinced him that his shoulder will be better than new and that his career is about to see its brightest moments. “When you walk into his office you feel that every staff member is part of a team that is meant to care for your needs. It starts day one, I work for the DSNY and I hurt my shoulder which could have ended my service. It was important to me to find a shoulder doctor who could help me get back to work and help me finish my career. I researched for the best orthopedic surgeons in the area, I found Dr. Tehrany and considered his education and experience and found he was the right choice after surgery and recovery I feel the shoulder is better than before I hurt it. I lift heavy loads all day long and have no pain and more strength in my arm. I have sent many people to him and all agree he is the best choice and the staff is A#1. My ability to support my family was in his hands and he exceeded everyone’s expectations. Thank you Dr. Tehrany”, wrote Brian Sobal in his patient testimonial. We have never had such an overwhelming experience with a patient who with only one shoulder surgery was transformed into an optimistic, funny and heartful person. We wish you all the luck in your career Mr. Sobal! Stay this positive and keep up the awesome work!